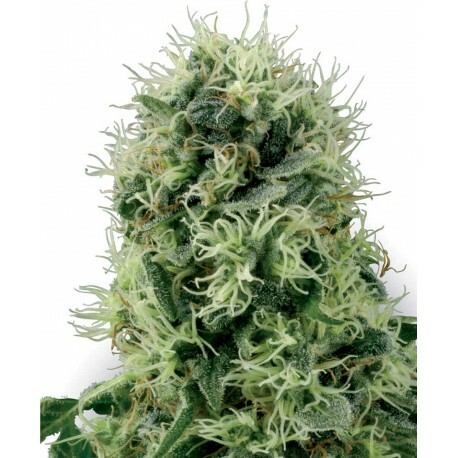 The feminised weed seeds of the Pure Power Plant are an extremely interesting variety for the grower who gets excited about a great harvest. The genetics applied by the breeders of White Label has led to a type of cannabis seeds in which both the sativa and the indica properties have established their own space. These weed seeds will not cause too many problems for the starting grower. The plant continues to grow imperturbably and stress is something the plant is really unfamiliar with. Experienced growers also swear by these wees seeds because the yield is extremely high. On top of that, the weed is of the highest quality so all the more reason to buy these weed seeds. The compact buds, abundantly covered with leaves, reveal the indica genetics in this Pure Power Plant. The sativa properties are actually only discovered when you smoke this type of cannabis and have an immediate effect; you will certainly get high with the Pure Power Plant. You just take the stoned feeling as it comes with these cannabis seeds: so, a perfect combination all in all.